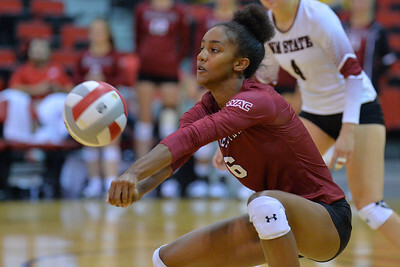 August 26, 2016; Las Vegas, Nev.; New Mexico St. outside hitter Tatyana Battle (6) digs a ball during a match between the New Mexico Aggies and UC Santa Barbara Gauchos. UCSB defeated New Mexico State 3-2. 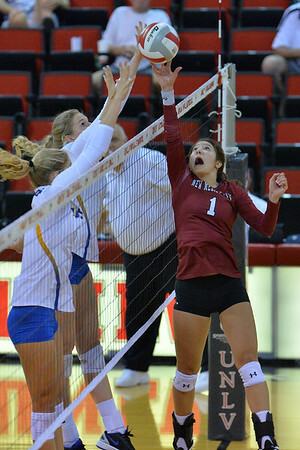 August 26, 2016; Las Vegas, Nev.; New Mexico St. outside hitter Jordan Abalos (3) passes a ball during a match between the New Mexico Aggies and UC Santa Barbara Gauchos. UCSB defeated New Mexico State 3-2. 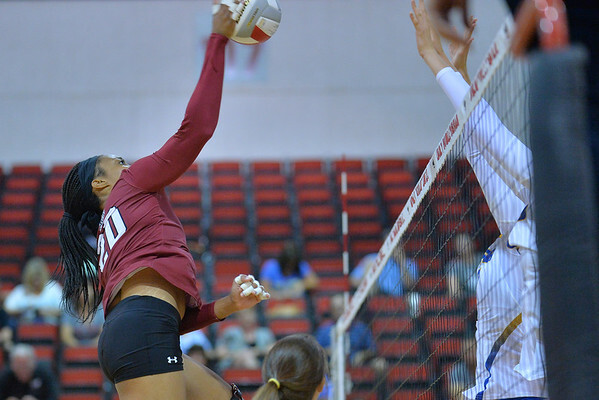 August 26, 2016; Las Vegas, Nev.; New Mexico St. setter Alexsa Parker (13) sets a ball during a match between the New Mexico Aggies and UC Santa Barbara Gauchos. UCSB defeated New Mexico State 3-2. 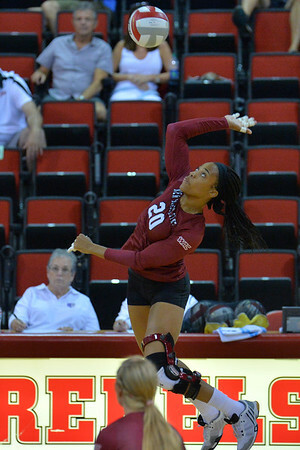 August 26, 2016; Las Vegas, Nev.; New Mexico St. middle hitter Sasha-Lee Thomas (20) takes a swing during a match between the New Mexico Aggies and UC Santa Barbara Gauchos. 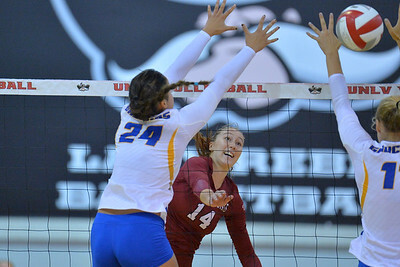 UCSB defeated New Mexico State 3-2. 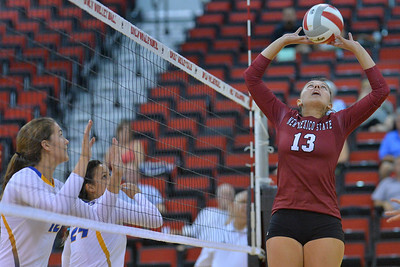 August 26, 2016; Las Vegas, Nev.; New Mexico St. outside hitter Kassandra Tohm (14) tips a ball over the net during a match between the New Mexico Aggies and UC Santa Barbara Gauchos. UCSB defeated New Mexico State 3-2. 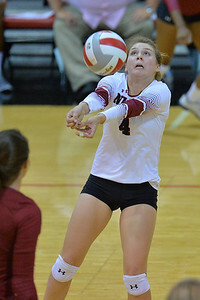 August 26, 2016; Las Vegas, Nev.; New Mexico St. middle hitter Hannah Combs (15) takes a swing during a match between the New Mexico Aggies and UC Santa Barbara Gauchos. UCSB defeated New Mexico State 3-2. 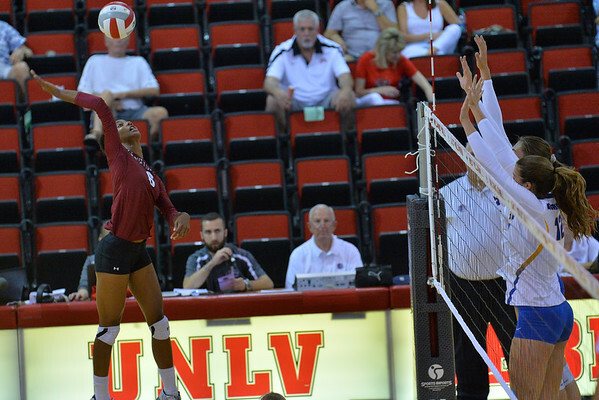 August 26, 2016; Las Vegas, Nev.; New Mexico St. setter Brianna Ainsworth (1) makes a one-handed set during a match between the New Mexico Aggies and UC Santa Barbara Gauchos. UCSB defeated New Mexico State 3-2. 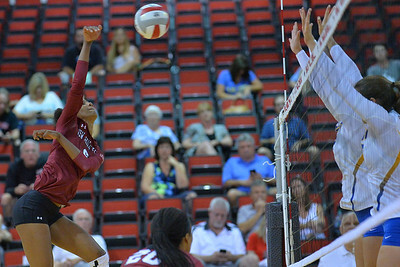 August 26, 2016; Las Vegas, Nev.; New Mexico St. outside hitter Jordan Abalos (3) takes a swing during a match between the New Mexico Aggies and UC Santa Barbara Gauchos. UCSB defeated New Mexico State 3-2. 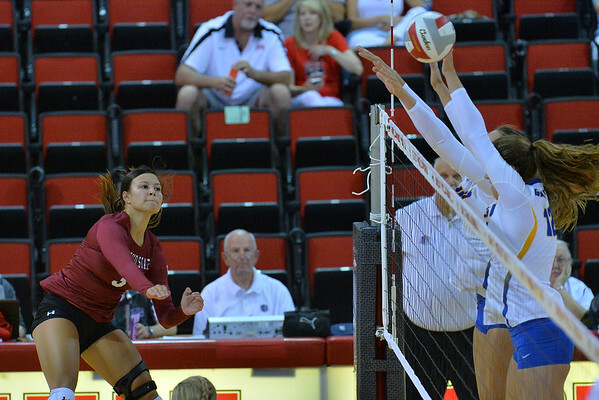 August 26, 2016; Las Vegas, Nev.; New Mexico St. outside hitter Jordan Abalos (3) fires a ball through the UCSB block during a match between the New Mexico Aggies and UC Santa Barbara Gauchos. UCSB defeated New Mexico State 3-2. 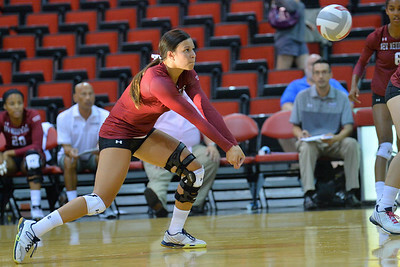 August 26, 2016; Las Vegas, Nev.; New Mexico St. libero/defensive specialist Ariadnne Sierra (4) passes a ball during a match between the New Mexico Aggies and UC Santa Barbara Gauchos. UCSB defeated New Mexico State 3-2. 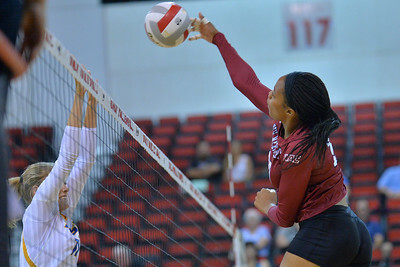 August 26, 2016; Las Vegas, Nev.; New Mexico St. outside hitter Tatyana Battle (6) takes a swing during a match between the New Mexico Aggies and UC Santa Barbara Gauchos. UCSB defeated New Mexico State 3-2. 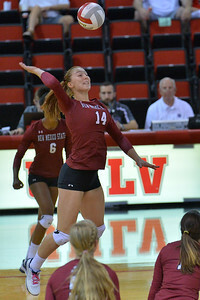 August 26, 2016; Las Vegas, Nev.; New Mexico St. outside hitter Kassandra Tohm (14) takes a swing during a match between the New Mexico Aggies and UC Santa Barbara Gauchos. UCSB defeated New Mexico State 3-2. 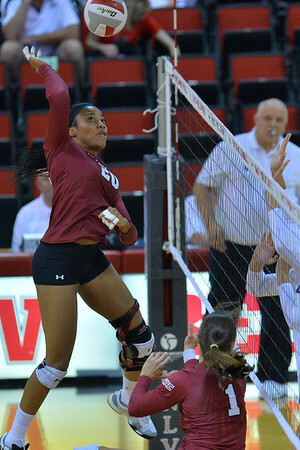 August 26, 2016; Las Vegas, Nev.; New Mexico St. setter Alexsa Parker (13) flashes a sign to her team during a match between the New Mexico Aggies and UC Santa Barbara Gauchos. UCSB defeated New Mexico State 3-2. 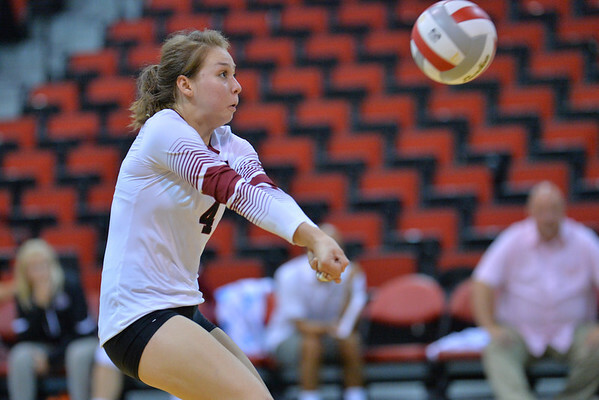 August 26, 2016; Las Vegas, Nev.; New Mexico St. libero/defensive specialist Kaylee Neal (8) digs a ball during a match between the New Mexico Aggies and UC Santa Barbara Gauchos. UCSB defeated New Mexico State 3-2. 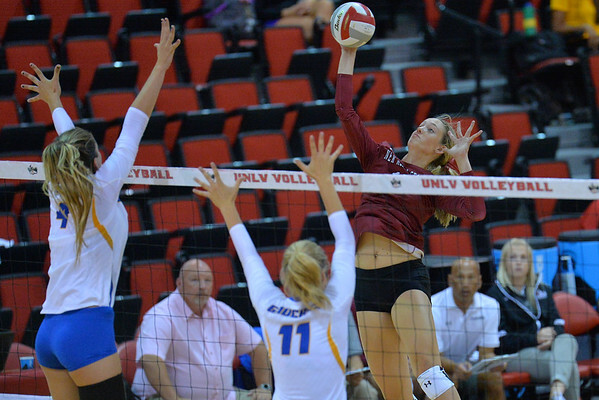 August 26, 2016; Las Vegas, Nev.; New Mexico St. middle hitter Hannah Combs (15) gets a kill during a match between the New Mexico Aggies and UC Santa Barbara Gauchos. UCSB defeated New Mexico State 3-2. 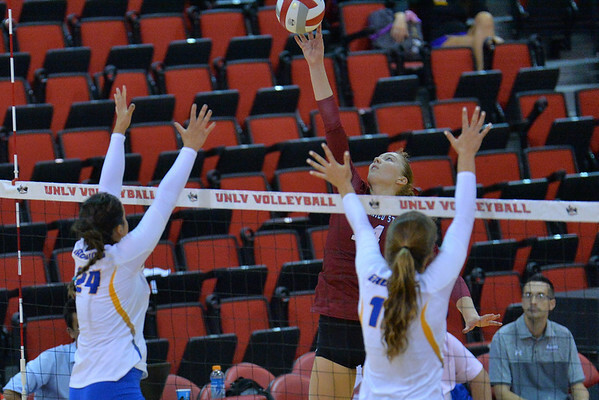 August 26, 2016; Las Vegas, Nev.; New Mexico St. outside hitter Kassandra Tohm (14) fires a ball past the blockers during a match between the New Mexico Aggies and UC Santa Barbara Gauchos. UCSB defeated New Mexico State 3-2.